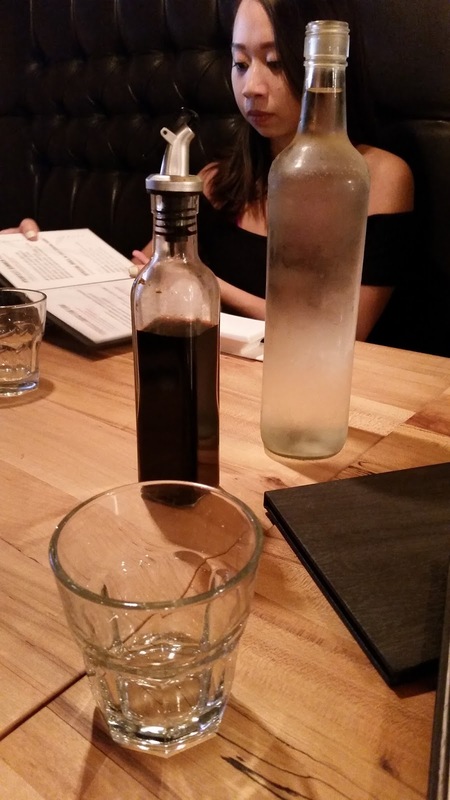 Being currently located in the downtown core, I had the privilege of exploring many Japanese restaurants. I saw one of my friends post on her Instagram visiting Saku, and I fell in love with the photos I saw. Determined, I decided one afternoon that my girl friends and I would go and try this out for the first time! We were greeted by the waiter and he quickly took us to our seats. Immediately when we sat down, we were greeted with beautifully chilled water and glasses, which was extremely satisfying given the temperature that day! We were handed the menus, ordered our Lunch Specials and waited patiently for our lunch. Within a few minutes and after some small exchanges of chit-chat and selfies, we were given our appetizers, which came with our Lunch Specials. 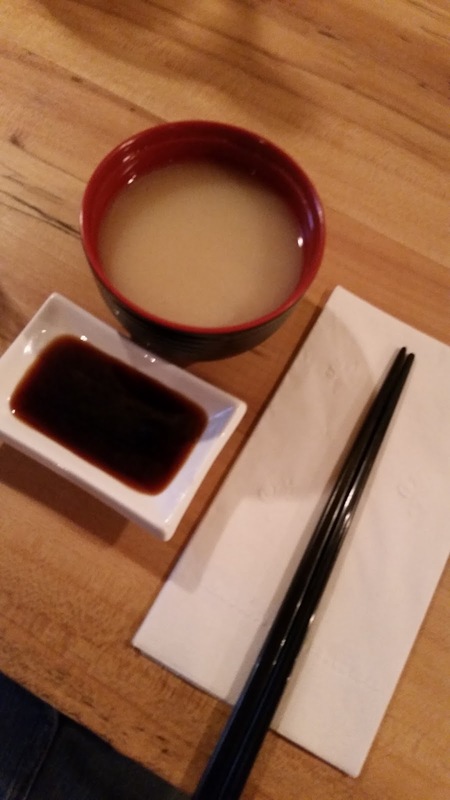 Saku has a beautiful deal where you can order any choice of Special Roll, and add Miso Soup and a choice of special salad for an additional $3.50. In all honesty, I was expecting a regular Japanese-styled salad with just the signature sauce on top of the vegetables, but when we were greeted with these absolutely stunning salads, my friends and I were completely in awe. 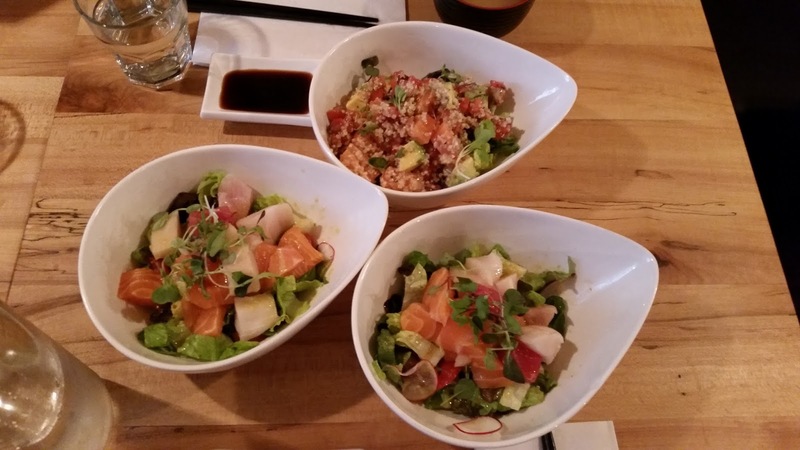 Christina and I ordered the Yuzi Sashimi Salad (because who can say no to sashimi?!) It was extremely fresh, extremely delicious, and the sashimi clashed beautifully with the sauce tossed into the salad. 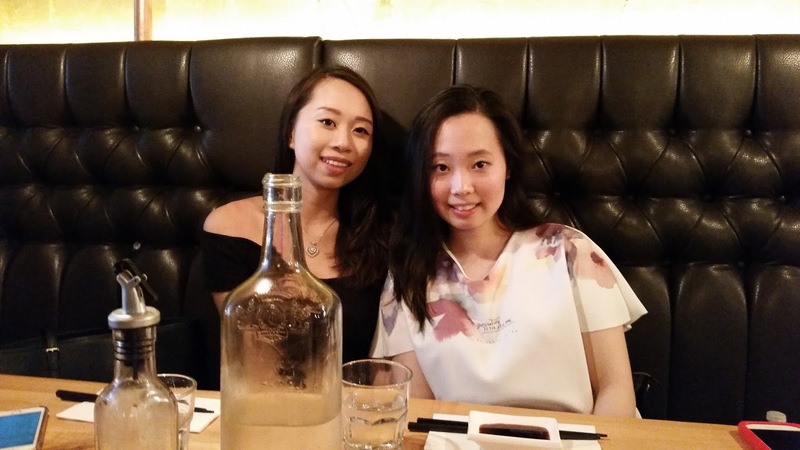 My friend Sonya picked something different from us – she ordered the Quinda Salmon Salad, which was equally as beautiful and delicious. All three of us expressed surprise at the quantity of the dish, as well as the quality, which is a unique experience to have at new visits! 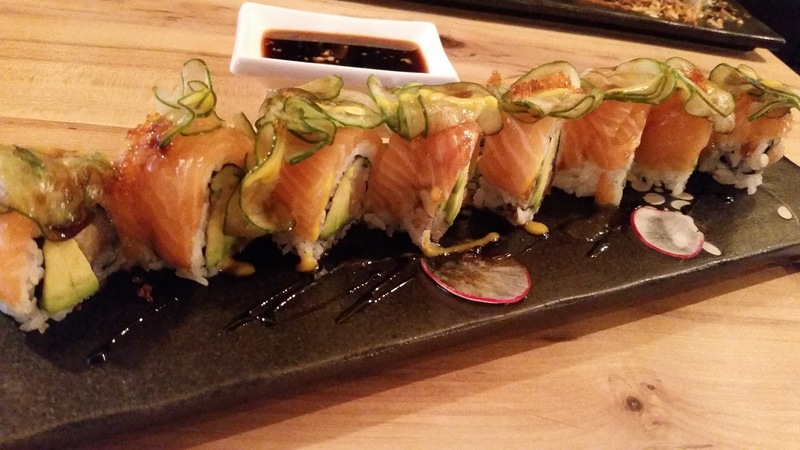 In the process of finishing up the salads, our special rolls came out and all I must say is that the rolls were everything that I could ever imagine, both in presentation and in taste. 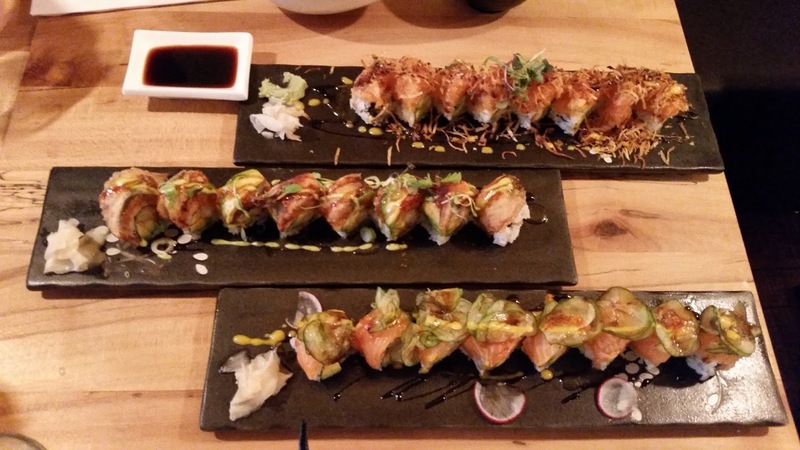 These rolls were phenomenal and the satisfaction we already had at the beginning just increased spontaneously. Despite the size of the rolls, and the feeling of fullness after the appetizers, all three finished the rolls eagerly (see the caption under the photo for what we ordered!). 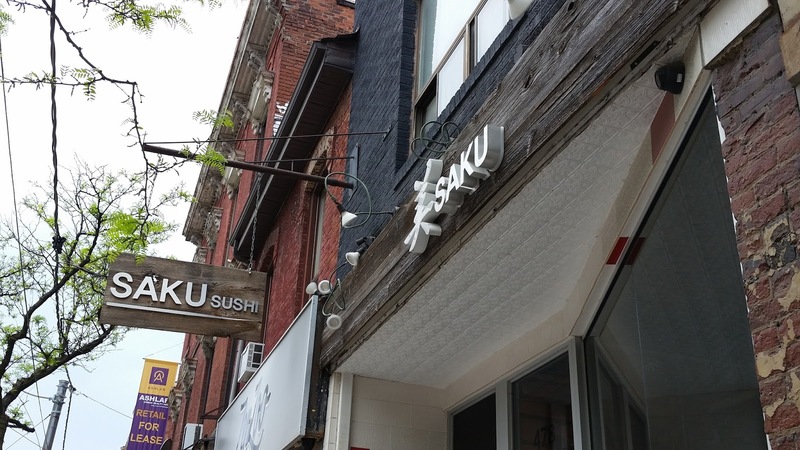 The visit to Saku was definitely a worthwhile one, despite commuting from Osgoode station in the scorching heat (at least we had some great chilled water at the restaurant!). 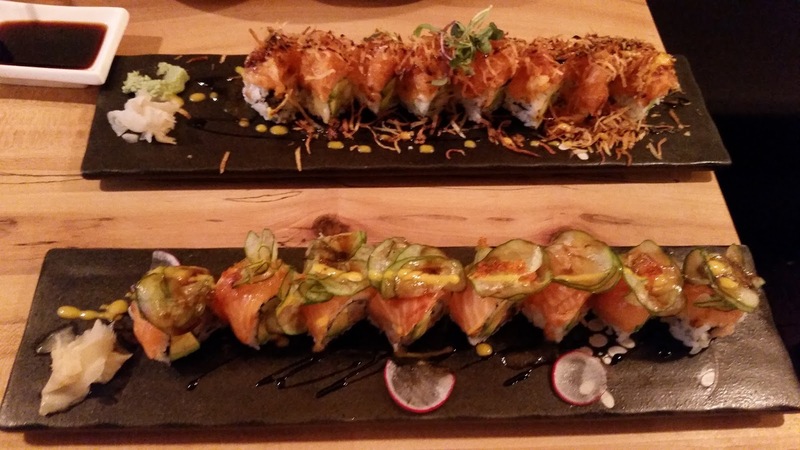 Writing this post now, I’m actually thinking about when my next visit will be to Saku! 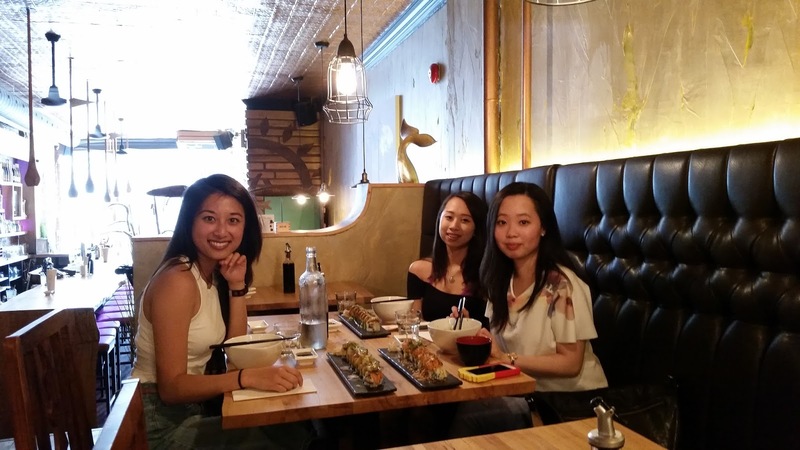 For quality, for taste and for deep satisfaction – Saku Toronto caters to all sushi lovers alike.